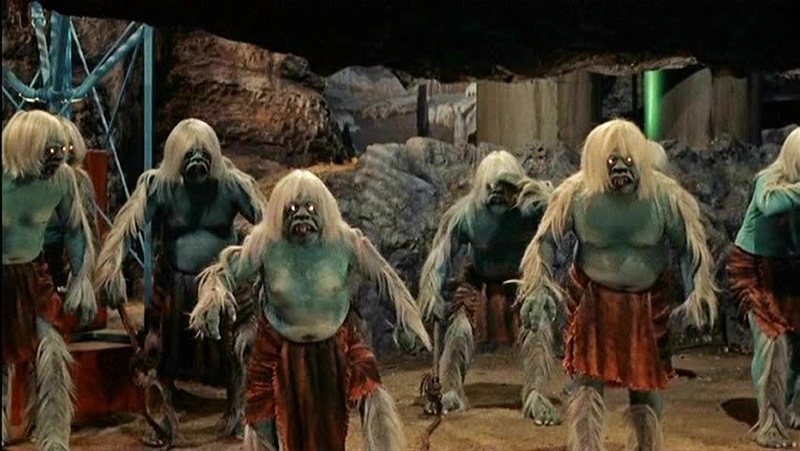 Donna and I saw in the New Year as we saw in the New Century: by watching George Pal's 1960 classic THE TIME MACHINE, which made its Blu-ray debut in 2014. I'd heard some quibbles about the Turner Entertainment presentation, but it was far closer to the experience I remember feeling theatrically (I saw a matinee revival in the late 1960s or early '70s) and - despite rather dullish-looking titles, some individually grainy shots and some special effects shots that make an honest show of their rough edges - everything we hoped it would be. The Morlock sequences, especially, have wonderful depth and color, and Wells' prediction of the shoegazing Eloi has come to pass sooner than he could have imagined. It remains one of the cornerstone works of filmed science fiction, from one of its warmest and wisest voices. We also enjoyed seeing our beloved friend Bob Burns show up in Clyde Lucas' (no relation) accompanying featurette THE TIME MACHINE - THE JOURNEY BACK, a 1993 documentary about the eponymous prop which includes a little pocket drama written by original screenwriter David Duncan, in which George (Rod Taylor) and Filby (Alan Young) are finally reunited. The odds were incalculably against it, but somehow the gentle hand of George Pal seems to have touched it - and it works. This was the first time we'd watched the film since actually visiting with the Time Machine itself in Bob's legendary basement, and it was nice to discover that, as a result, the film now feels even more infused with love, warmth and nostalgia.